Westown Hotel is a 4-Star luxury hotel in Ikeja, Lagos. It is strategically located at 7, Sheraton-Opebi Link Road, Ikeja-Lagos, around the heart of economic activities of Lagos State. It is surrounded by many leisure and recreational spots such as the cinemas, golf courses etc. It is about 2km from the city centre and just a 10-minute drive from the Murtala Muhammed International Airport. 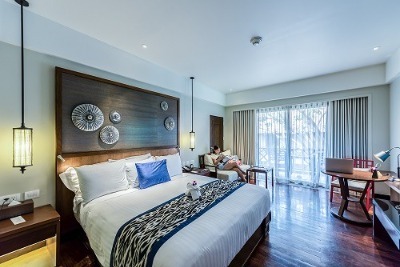 Westown Hotel has a total of 82 rooms with modern designs and furnishing. Room categories include: Superior room, Deluxe room, Junior Suite and Executive Suite. The rooms are spacious and fully air-conditioned. Each room is fitted with an en-suite bathroom, wardrobe, in-room safe and mini bar. Each room at the Westown Hotel Lagos features bedside tables with ornate lamps, work table, refrigerator, telephone and bottled water. All guests are entitled to complimentary breakfast. A number of facilities are available in Westown Hotel, such as: A restaurant, gym, a bar, a rooftop swimming pool, a meeting hall and an events centre. Guests can exercise at the gym, go for a dip in the pool or relax at the bar with friends listening to live music. The hotel offers additional services on requests, such as: Laundry / Dry Cleaning, Car Hire and Ironing. Q: Does Westown Hotel offer free Wi-Fi? Q: Does Westown Hotel have a swimming pool? Q: Does Westown Hotel offer complimentary breakfast? Q: Is there a fitness centre/gym at Westown Hotel? what type of equipment are available? A: No. There is no fitness centre/ gym at the hotel. Q: Does Westown Hotel have a restaurant? A: A restaurant is available at Westown Hotel. Westown Hotel is hotel in Ikeja, Lagos. I really love this hotel. Checking in was swift and effortless, because I made my reservation online already so when I got to the hotel I just made payment. Secondly, my room was very comfortable with everything that was needed to make my stay a beautiful one. The hotel attendants were also very nice and cheerful. This hotel has an excellent location, well appointed rooms, very hospitable owners and staff. Would 100% recommend this Almost everything! Staff is very helpful, the location is wonderful, facilities are top-notch and the rooms are beautiful. The whole concept of dining with the other guests is really nice. Probably one of the best places we've ever stayed. The hotel was clean and beautiful,the hotel was easy to locate.My room was beautiful and comfortable.They have excellent customer service and their food was delicious.I really enjoyed my stay. Westown is a very good place, they have a very welcoming staff and friendly ones at that too, they are quick to respond to client's complaint and they make adjustment quick. The room I got was nice and the restroom was neat also. I was satisfied with the quality of service on offer there and their facilities are in good shape. I liked it there. Have nice pictures of Westown Hotel?